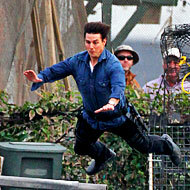 Don’t you ever doubt that Tom Cruise does his own stunts! Our latest Vulture on Set takes us to L.A., where Cruise and Cameron Diaz are shooting the action comedy Knight and Day, about a secret agent forced to pull his blind date into a madcap adventure. (This is the one that had all those bulls escape from the set.) The trailer was already released, but we guess the producers later realized a movie can never have enough shots of Tom Cruise dramatically jumping and hanging onto things.